me and him: blue chalk = TICKET?!?! Have you ever parked in a two hour parking spot? (or hour, or thirty minutes...the amount of time really doesn't matter for this conversation....) Have you ever thought to yourself, how would they know if it was over two hours anyway? WELL! Today I had an awakening about this very subject. While walking down the side walk of Main Street I came upon a police officer who was walking along the back of all the cars parked on the street. I noticed that she was carrying a large pole with her. I then noticed that as she was walking along she would rub the tip of the pole on the back right tire of the car. Not long after I noticed this little phenomenon taking place Maggie (who had been walking beside me)stated that there was blue chalk at the end of the pole. So THAT'S how it's done! They mark the tire, then they wait two hours and check to see which tires have marks on them and they give them tickets! Who knew??? Well, now you do. That lady that you saw is the same one that we treat real nice here at the jewelry store so she just my skip our car when it has been parked there a little too long. That picture is pretty accurate except for a couple things: 1. The actual lady is about 65 and 2. Her shorts are quite a bit shorter, so it really isn't the most pleasant sight. SHE really ought to receive a citation for such a thing. Ger- You crack me up! How are you?? Jake and I are doing great...we're just in Portland for the summer as you probably read and it's definitely been a culture shock for me! The people are so different here! It's been good for me to have to dig deep and find the good in everyone! What have you guys been up to?? I remember learning this when I was a little girl. Mom would leave us in the car (you weren't born yet) while she ran into stores there in downtown IF. So, I'd hold a bottle of mace in my hand (it had its own little leather pouch) and watch the meter reader mark the tires and/or write tickets. What a funny memory. Thanks. I'm not sure, but I think I would hate that job. I also think that I was lucky that I didn't go to jail for leaving my kids in the car.....poor Cass with her mace. 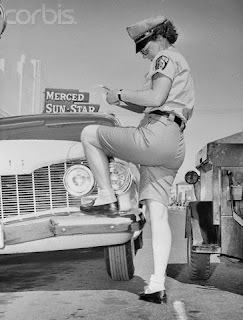 I love the picture of the lady parking ticket officer. The folded down socks in the penny loafers bring back fashion memories. So that is how those son's a B's catch ya!! I haven't actually ever gotten one... but I have had a boot and a TOW! Both while I lived in Salt Lake. I am guessing it's the same lady who's been doing it in rexburg for years. Always remember seeing her outside of tangles and reflections, and tips n tans, when my aunt's owned it. Pretty nifty tool. Why is rexburg the king of parking tickets, always a nightmare.